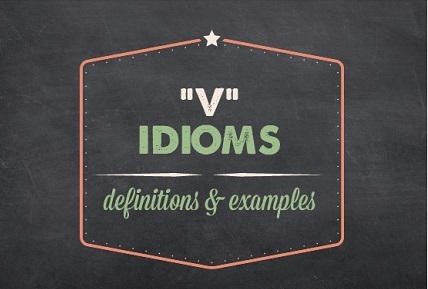 This list of V idioms have a main word that begins with the letter "V." Don't worry, I've also covered the other letters of the alphabet: click here to go to the main idioms page. Did you remember that an idiom is a group of words whose meaning is different from the individual words if you looked them up separately in the dictionary? Good! Let's look at the most popular V idioms. You can also find many idiom definitions using an online learner's dictionary. I actually recommend that my beginner and intermediate students focus on understanding, rather than using, idioms at the beginning. It's really easy to make mistakes with idioms because many are a bit tricky. Nonetheless, practicing by trying to write your own sentences is going to help you remember them better and this is a safe environment in which to practice. So try to use an idiom from the list above in your own sentence.